The Carlton Medium Storage Cabinet makes a wonderful addition to any kitchen, dining room or living room furniture arrangement. Store your fine china, movies or favorite decor pieces in the cabinet and the open bottom shelf. Its moulded and unique top details, shaker style doors, tapered legs and bronze hardware combine together in a pure sense of harmony. Rich in presence, this collection is timeless for the most discerning decorator. Add comfort to your dining room with this practical and timeless styled dining set from CorLiving. Includes 4 chairs with Shaker inspired styling, these armless dining chairs feature sleek backrests with vertical slats and formed wooden seats. Matching table constructed of hardwood and wood veneers in a Rich Cappuccino finish will compliment any decor setting. This quality product offers great value and assembles with ease. This dining set includes an extendable dining table and four solid wood dining chairs. The dining table features extendable lateral leaves that expand serving space, making this dining set ideal for those with smaller spaces. The white finish makes the timeless profile pop, making it easy for you to create a beautiful focal point in your dining space. This transitional 5 piece dining set offers a mix of classic and modern styling that will blend with any dicor. _x000D_ Finished in a rich cappuccino, this counter height set features a square table top, tapered legs and four matching side chairs with vertical slat backs and scooped seating for added comfort. Ideal for smaller spaces, lofts and eat in kitchens, this set will help create a timeless look that you and your family will love. This casual three piece dining set offers a classic look that will blend in with any decor. This rounded table features a solid-top drop leaf, straight edges and sleek square legs. The armless side chairs feature a ladder back design with padded beige micro-fibre upholstered seating for comfort. The clean lines of this set paired with a natural coloured finish, will help create a timeless look that you and your family will love. Carlton Medium Storage Cabinet & Buffet The Carlton Medium Storage Cabinet makes a wonderful addition to any kitchen, dining room or living room furniture arrangement. Store your fine china, movies or favorite decor pieces in the cabinet and the open bottom shelf. Its moulded and unique top details, shaker style doors, tapered legs and bronze hardware combine together in a pure sense of harmony. Rich in presence, this collection is timeless for the most discerning decorator. 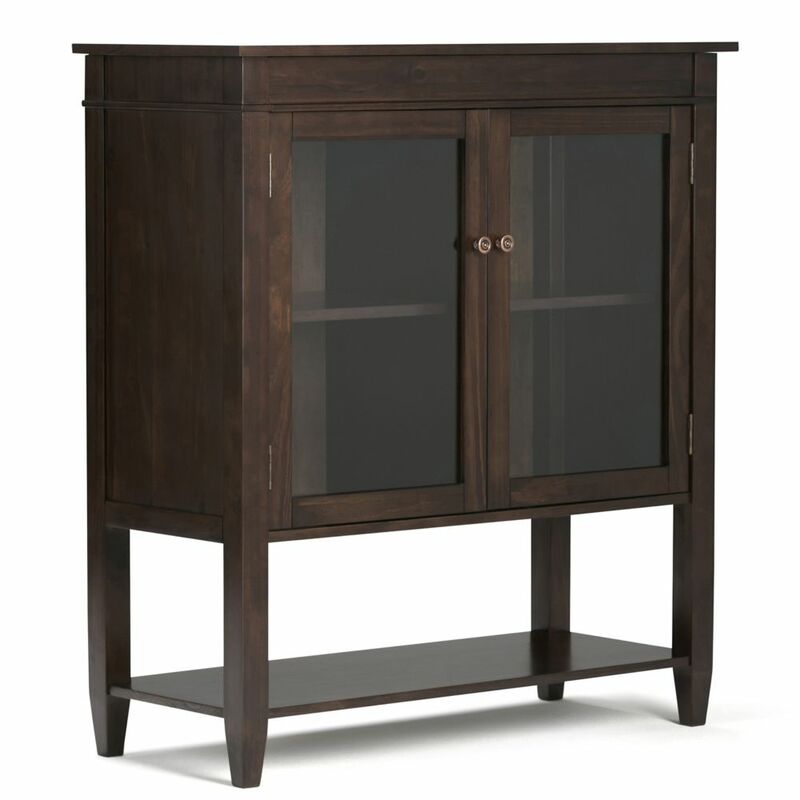 Carlton Medium Storage Cabinet & Buffet is rated 2.5 out of 5 by 2. Rated 4 out of 5 by pat48 from Not a bad cabinet for the price. The directions are not the best so if you can't troubleshoot, ge... Not a bad cabinet for the price. The directions are not the best so if you can't troubleshoot, get help that can read between the lines. Rated 1 out of 5 by firsttimehomebuyer from When putting this cabinet together, the wood would chip off because the holes wouldn't line up. ... When putting this cabinet together, the wood would chip off because the holes wouldn't line up. So since the holes wouldn't line up none of the pieces would fit or go in. After putting the cabinet together the doors will not close. I have emailed the company about this to see if the top part of the cabinet could be replace because it has a whole in the top of it. I have not received anything back. I wouldn't recommend this item.